This weekend we celebrated my nephew Timothy's 17th birthday. In past years, his parents hosted a family Pumpkin Party on his birthday. But now that they live in Idaho, my parents hosted the get-together. 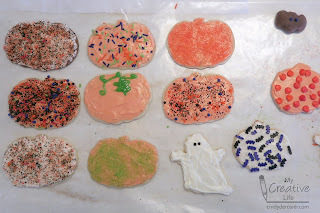 We didn't carve pumpkins, but we did do a bunch of Halloween crafting and had a lot of fun. 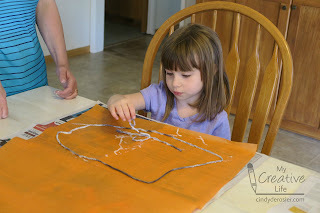 First up, Tissue Paper Jack-o-Lantern Suncatchers. This is a craft my mom used to teach as a preschool teacher. For years, she displayed the ones my sister and I made in preschool on her window. As her grandkids have reached preschool age, she's made this craft with them and her display has grown. Since cousin Allison is now preschool age, it was time for her to make one. Trevor and Timothy did too. The jack-o-lanterns weren't dry when we had to leave, so I don't have finished photos of them hanging in the window. Below you can see Trevor's artwork mostly complete. Once it's totally dry, you cut along the outside of the pumpkin and then hang it in a window. Unfold a sheet of orange tissue paper in front of you. 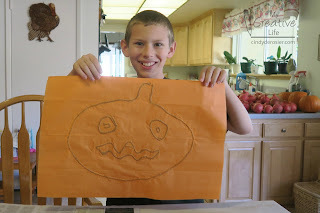 You will be designing your jack-o-lantern on the bottom half of the tissue paper only. 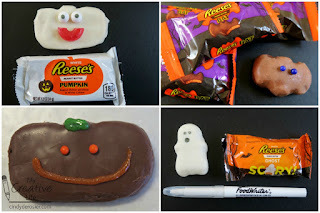 Use scissors to cut the yarn into lengths and arrange it on the bottom half of the tissue paper to make a jack-o-lantern. 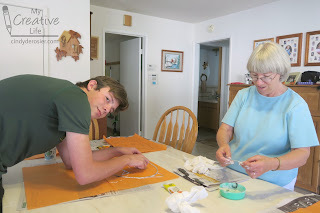 When you are happy with your design, dip each piece of yarn into the glue and then lay it back down on the tissue paper. Fold the upper half of the tissue paper over the lower half, then press to make sure the yarn sticks completely in all areas. 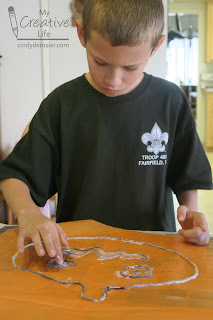 Let the glue dry completely, then cut around the outside of the jack-o-lantern and display it in a window. Some of the Hershey's candy didn't need any decorating. 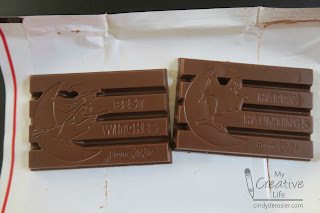 Check out these super cool milk chocolate and cookies'n'creme tombstones and the Halloween Kit-Kat bars. 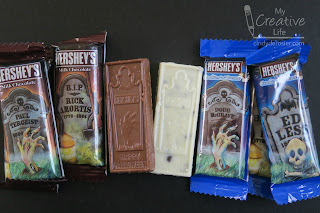 Huge thanks to Hershey's for the fun sample pack! Happy Halloween to you all! Tomorrow I will resume posts about our east coast travels. I left off with Valley Forge and Washington Crossing, which means Trenton is up next! How fun! Those sun-catchers look fun to make!!!!!!!!!!!! !